One of my favorite things to do is reading about how movies are made and especially how directors and actors are chosen for each project; there are characters impossible to imagine being played by someone else – can you picture Tom Selleck as Indiana Jones? – while with others I would have taken a different route: for instance, I would have chosen Vanessa Williams to play Storm instead of Halle Berry. 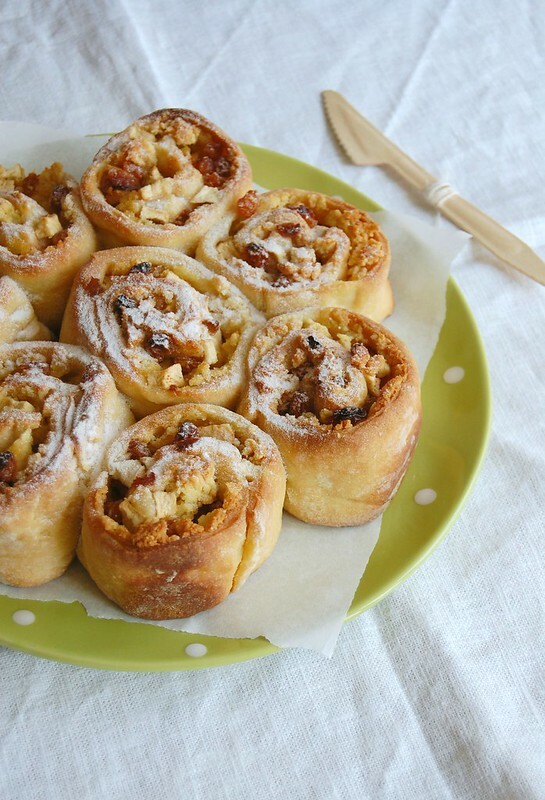 Ever since making Paul Hollywood’s marzipan for the first time I’ve been enjoying recipes I had bookmarked for years – these rolls come from Waitrose’s website and are every bit the delicious treat I’d imagined them to be. Place the flour, yeast and sugar in the large bowl of an electric mixer fitted with the dough hook. Make a well in the center and add the egg, butter, milk and vanilla and mix to combine. Mix at low-medium speed until it starts to form a soft dough. Continue mixing for 5-6 minutes or until dough is smooth and elastic – or knead by hand for about 10 minutes. Transfer to a lightly buttered large bowl, cover with plastic wrap and leave in a warm place for about 1½ hours or until the dough has doubled in size. Meanwhile, butter a 23cm (9in) round cake pan. Punch the dough with your fist to deflate, then tip it out onto a floured surface. Roll the dough out to a 40x20cm (16x8in) rectangle. Scatter the marzipan over the dough to within 1cm (½in) of the edges. Peel, core and chop the apple and scatter over the marzipan. Mix the raisins with the cinnamon and sprinkle them over the apples. Starting from a long edge, roll up the dough into a long, thin sausage shape. Using a small sharp knife, cut the dough into 8 even-sized pieces. Place them with their cut sides face-up in the prepared tin. Cover loosely with a piece of buttered plastic wrap and leave to rise again (prove) for about 1 hour until the buns have risen and become tightly packed in the tin (mine took 2 hours to prove). Towards the end of the proving time, preheat the oven to 190°C/375°F. Uncover the buns and bake for about 30 minutes until deep golden. Cover with foil towards the end of the cooking time if they start to over-brown. Cool in the pan over a wire rack for 15 minutes then carefully unmold onto the rack. Dust with icing sugar and serve warm or at room temperature. Lovely rolls, the filling sounds delicious!